January's offers are NOW LIVE and there are some inspiring offers to get you motivated for your dolls' house collection and hobby this year. Get busy with the revamp with savings on lighting sets. Lighting sets give you enough lights to do each room of your house and you can chose either the socket strip method or the copper wiring method. Socket strips allow you the versatility to put lights on individually by plugging them into the strip. Copper wire gives a slick finish and hard wires all the lighting in. For more information on the differences and to help you decide you can watch a video on how to light your dolls' house here. After you've put those lights in what about doing some interior design? Great offers on wallpapers and flooring covering can give you a new look for a super price. For as little as 50p (!) you can grab a paper to redo your living room with this stylish Leafy wallpaper or if you want to splash out, you could chose this delicate Blue Rose wallpaper at £1.31! If those little treats don't give you enough inspiration what about dressing the front of your dolls' house with a few flowers and window boxes? Or even a weather vane? Take a look at the accessories section of the special offers to see the full range on offer this month. January Offers are Now Live! Happy New Year! If you’re nursing a slightly sore head this morning, these cracking offers will help soothe away the pain. There’s certainly a lot to choose from with offers on furniture and accessories such as the pretty Cream Shoes or the Rose Arch, both great for creating a fairy tale scene. You can save up to 33% on lighting sets to add a warm glow to your miniature home. Lighting sets are a great way to get everything you need to light your home in one go. Perhaps Father Christmas didn’t quite get your list right and you’re still yearning for your first dolls’ house, you’d be hard pushed to beat The Classical Dolls’ House. Georgian architectural details, two front opening panels and 6 rooms to decorate make The Classical a long term favourite with all our customers. – Catch up with the Creative Competition winners on the blog and see what ideas you can use in your projects! Are you sitting comfortably? Turkey sandwiches at the ready? Then now is the time to make the most of the latest Dolls House Emporium offers! We’ve added a whole host of gorgeous goodies to the special offers today just for you to enjoy AND, as if that wasn’t enough, we’ve also added the Glow Well range so you can bring the realistic fire glow to your miniature home. These are detailed little fire grates that will really add a touch or realism to your manor kitchen with a bird roasting on the spit or the embers flickering in the drawing room after dinner. So put down the turkey sandwich and go shopping! December Offers are Now Live! There’s plenty of time to make the most of the offers this month and there are a lot of great deals to fill stockings or be that ‘big’ gift under the tree. To decorate your own miniature home, visit the Christmas section, will you lay out a feast for the festivities? What about Father Christmas’s workshop for a different twist on an old classic? For the younger collectors and the perfect Christmas present, we’re featuring a selection of great furniture and accessories on offer, they really will make little faces light up on 25th December. You can compliment them with a house too! If you’re looking for your own great gift (and need to make a few hints!) 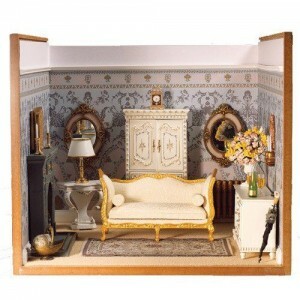 there is a range of smaller projects and dolls’ houses across the website. One personal favourite is the room-display box, (and now only £19.99!) such a versatile piece, re-use it over and over and create anything you can imagine! We have a small selection of built houses and additional properties for sale for just two weeks at 25% off! When these house have gone, they really are gone! If you're looking for that perfect gift now is the time to snap one of these up. Stratford Bakery is a stunningly detailed dolls' house with it's beams, overhanging first floor and outside staircase. This property has quite a small footprint so is ideal if you're a bit short of space but still want to embrace your creativity and develop your mini property empire! As an older style property you can keep it strictly in keeping with it's period with dark oak furniture, pewter utensils and dolls' dressed to match. Of course, these buildings have been with us for such a long time you can turn it into anything you want! Having been built by our expert house builders, all you need to do is unwrap the dolls' house and plug in the transformer to have a decorated, lit dolls' house ready to dress and enjoy. It's available now for just £515 saving you £175! Oak Hurst Gardens is a thoroughly contemporary abode, you might even know someone who lives in a house just like it. 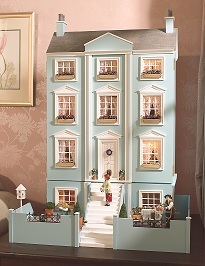 With three floors, totalling six rooms there is a lot of scope to enjoy this clever dolls' house. Built by our dedicated house builders you can purchase it for the next two weeks with a saving of 25%, at just £410! You'll receive a built, decorated and lit dolls' house ready for your furniture, dolls and accessories to tell your miniature story. The house has a central staircase and opening roof panel giving access to the two loft rooms. These houses are in very short supply so if you want one we urge you to order now! Call 01332 912989 or go direct to the website now!